I just love this idea! Small long pieces of card with a photo or some small piece of art. 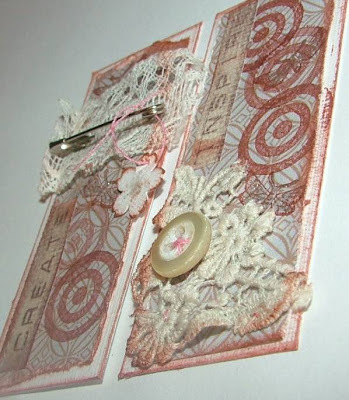 Wednesday Stamper's challenge of the week has introduced me to them - do check the site out! Anyway, just had to have a go and enjoyed it very much. It was a great way of focussing creative energy, by having a small and more unusual shape to decorate. They are 2.8cm by 7cm. 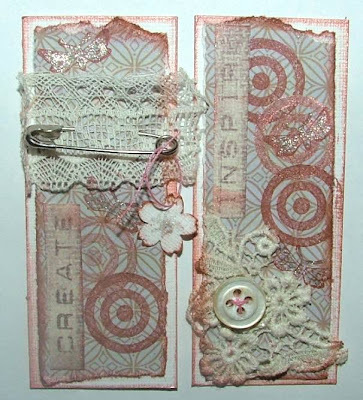 Ingredients: PP by TLC and Kelly Panacci, stamps by Rubber Stampede and Hero Arts, vintage lace and button, flower punch and safety pin. Luke is going to a birthday party tomorrow, so I thought i'd make a card with a difference for the birthday girl. It's more of a hanging, apparantly she's having a "new" bedroom, she's become more girly - thought this would look nice on her bedroom door. Ingredients: PP by TLC and Brenda Walton, Chipboard flowers by TLC, flower and circle punch, Quickutz Eliza alphabet, Fiskars scallop scissors, Hero Arts leaf stamp. JOY - the 2nd attempt! Managed to squeeze making this card whilst waiting for dinner to cook. 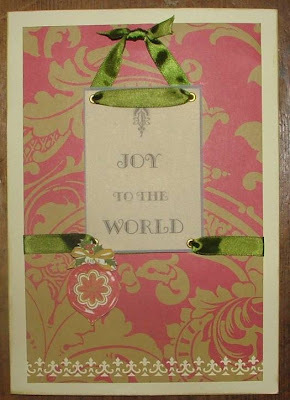 Wanted to create a "joyous" effect. And the line "The Joy of the Lord is my Strength" has been going through my head today. I really want to meditate on it and consider what it really means and how that impacts my life. Particularly as a wife, mother and sister in Christ. 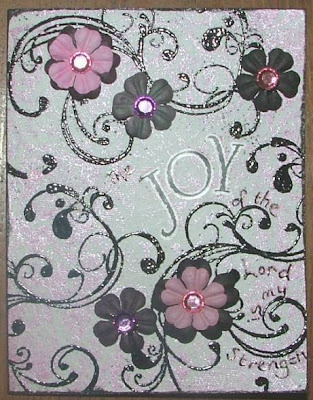 Ingredients: Stamps by Rubber Stampede and Rhonna Farrer, black embossing powder, primas, jewels, letter stickers, Sakura gel pens. I'm pleased to announce that I've been asked to join the Debbi Moore design team! Debbi is expanding her business and has apeared on PaperCrafts4u on one of the sky channels, and is due to appear soon on QVC. There's a few of us apparantly, so not sure when my turn will come round to be sent a kit to create some cards with. Will let you know! But I won't be able to show you anything until it officially starts to get sold. Again, I've had a busy week and not much time for crafting, so struggled to get this one done! Not entirely pleased with it so may have another bash when more time is available! When things are going well in life we feel happy and joyful, but sometimes circumstances of life may cause us to feel sad, but even at those times we can still experience the joy of the Lord. I'm reminded of the verse in Nehemiah 8:10b: 'for the joy of the Lord is my strength'. so that we and others may see your work. 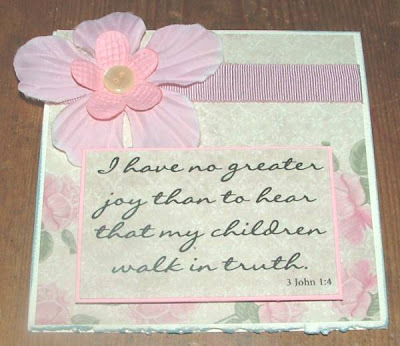 Ingredients: DCWV vellum quote, Anna Griffin paper and punch., ribbon and eyelets. Had a busy week settling back into school routine, also a mum of a boy in Lukes class has not been well so I've been picking up her little boy to take to and from school. Inlaws were up to, had a nice but full week so no card making, nor even my Salt challenge for this week! Please still have a look at everyone's creations, they are all beautiful and inspiring. 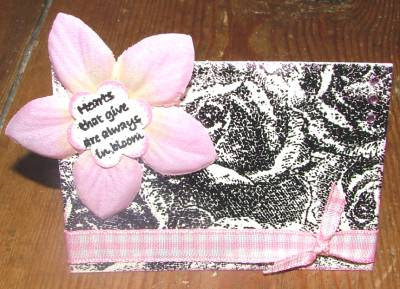 Made this for the Caardvarks micro min challenge of making a card atc size. And this one for the DCM challenge to use a word as the central focus of the design. 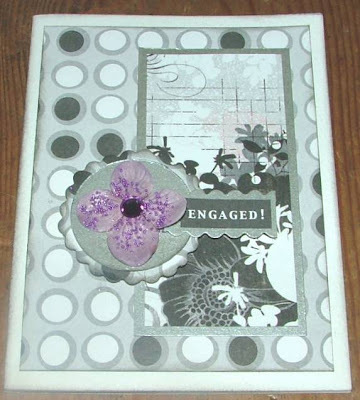 I punche out circles along the bottom of the card and then stamped inside them to the back of the card. Stickers??? Who would admit to using stickers om cards? Sorry if I've offended anyone, but i'm one of those people who cringe at the site of badly used peeloffs. Ok, I understand they can be very useful in the right context. Anyway, Caardvarks most recent challenge is to use a sticker on a card, and there's some goodies up for grabs too. Here's my card... for a family who are having a Thanks-giving service for their little girl tomorrow. 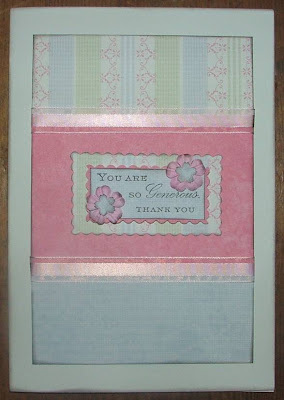 Ingredients: PP by HOTP, sticker by TLC, flowers from local source and Prima, vintage button, and some grossgrain ribbon. Ingredients: PP by Basic Grey and I think it was DCWV, scallopped scissors, fiskars shape cutter, Prima Hydrangea, miscrobeads and crystal and silver CS. 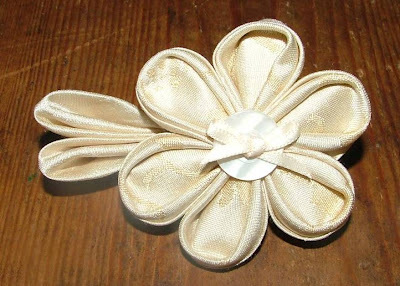 Couldn't resist using a lovely piece of scrap pale gold silk brocade and some pale gold silk dupion to make this hair clip. Going to have to give it to someone left handed as I've stuck it that way! doh! The brocade had interlining on it so made it really stiff, its created a lovely shaped petal. I love discovering new crafts. Heres an old craft, but new to me. 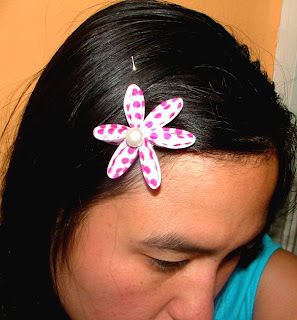 Used to create beautiful hairpieces for Geisha, this is the art of silk flower making. 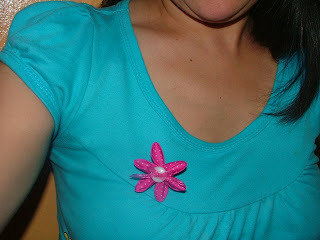 If you search for Tsumami Kanzashi on Google, you will find numerous tutorials on other folks blogs. As with all ancient crafts people have updated them for today's use. 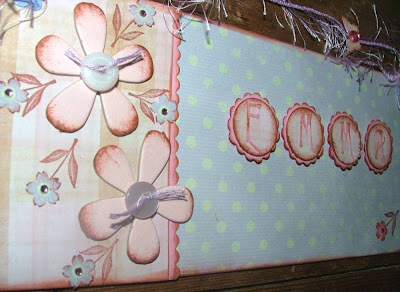 The use of stitching and glue guns instead of the traditional rice glue can be less fiddly and time consuming. Also fabrics other than silk can be used. Here I have used a fab polka dot cotton. I looking forward to experimenting with all my scraps of fabric that I have hoarded away. So watch this space for more creations. I took these photos before I spread the petals out more to make them more rounded. 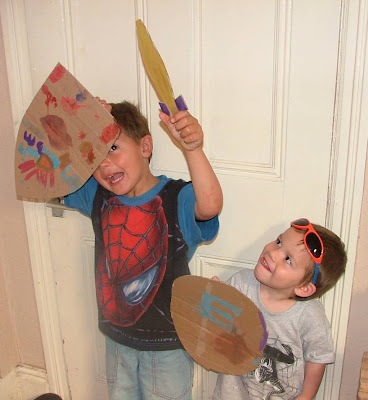 Made cardboard shields and swords with the boys today. Last day of holiday before school tomorrow! Have polished Luke's shoes, given him a haircut and bought new plimsoles. No news yet on the Pepsi challenge. Tom actually won with a previous entry the other week, however we are still waiting for them to announce the pepsi choice winners for this last week. We're constanly checking the website and our emails to see what's happening. Will let you know if there is any news! I am trying to revolutionise our home organisation system, basically we haven't really had one! But since hitting 30 and now being the proud mum of 3 children I realise that my messy ways are a hindrance to family and crafting life! So I have developed a 4 week rolling rota of the chores I need to do everyday/week/every 4 weeks and have got plans for involving the children in little jobs they can do every day too. What home organisation tips do you have? All tips greatfully recieved! Made a card! I have a lovely uni friend who I am terrible at staying in touch with. he and his wife are so faithful sending pressies for the children and postcards whenever they go on holiday. So I though I'd make a special card and put pen to card and write a long letter. Although in this day and age it is easy to phone or email, I think it is so special to recieve something by post still. 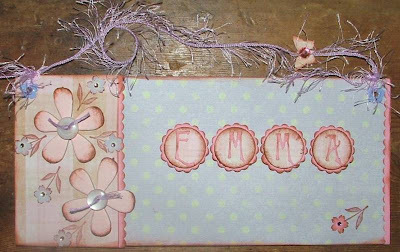 Ingredients: PP by HOTP, Stamps by Anna Griffin, ribbon, Prima flower and flower punch.